Penny: We're going to Disneyland and ride the Matterhorn? Leonard: How does that involve air travel? Penny: We're going to Disney World and ride the Matterhorn? 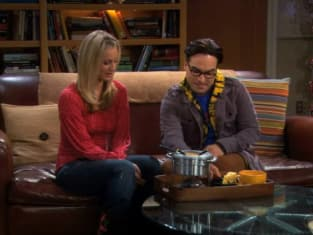 The Big Bang Theory Season 3 Episode 15: "The Large Hadron Collision"
Leonard: This tray contains clues as to what you and I are going to be doing on Valentine's Day. Penny: Wow okay, let's see. We got milk chocolate, Swiss cheese, fondue... my lactose intolerant boyfriend is going to eat all this and I'm going to climb on your back and rocket to the moon?